Google updated the Android distribution numbers last night for February and they show a massive jump for Nougat to over 1%! In fact, the jump was even more significant than that, if you count the extra 0.2% on top of that, which brings Nougat’s cut of the pie to 1.2% and counting. Man, this is big. Really big. Yuge even. All sarcasm aside, Nougat did jump from 0.7% to 1.2% in a month. Cool. In other numbers, we have Marshmallow jumping from 29.6% to 30.7%, while everyone else fell. 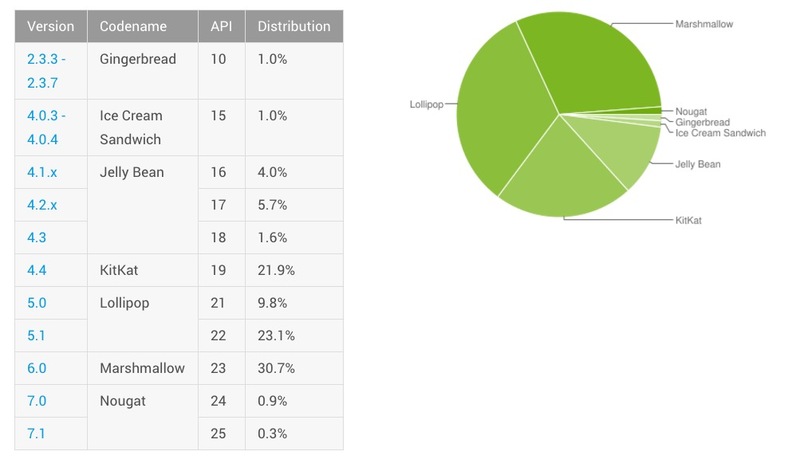 Lollipop now sits at 32.9%, KitKat at 21.9%, Jelly Bean at 11.3%, and Ice Cream Sandwich at 1.0%. Gingerbread rounds out the platform versions with a solid 1.0% of the pie, almost as much as Nougat controls. Last month’s numbers can be seen in full right here.